During the preview of the 16th International Architecture Exhibition – La Biennale di Venezia, we also visited the pavilion of Greece in the Giardini della Biennale. Under the title, The School of Athens, the curators, Xristina Argyros and Ryan Neiheiser from London-based firm Neiheiser Argyros, examine the architecture of the academic commons. The Greek national participation for the !6th Architecture Biennale in Venice was a real highlight for us, in terms of both the pavilion content and its set-up in the Giardini, created by Napoleon Bonaparte in 1807 when he ordered that the city of Venice needed public green areas. With 60,000 square metres crafted by Giannantonio Selva, it is the largest green park in the historical centre as well as being the site of the Venice international art exhibition. Against this backdrop, the pavilion of Greece was built in 1934 by the architects George Papandreou, from Greece, and Brenno Del Giudice from Italy, and is a neo-Byzantine style building on a stepped base surmounted by a triple arch with two white marble columns. 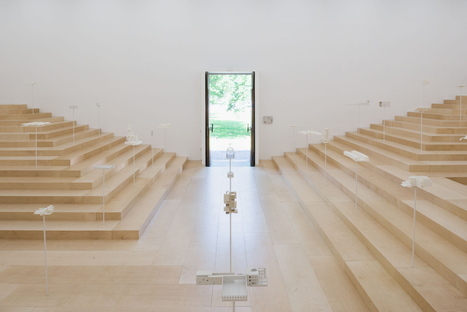 In the interior hall, the curators - Xristina Argyros and Ryan Neiheiser from London-based studio Neiheiser Argyros - referenced Raphael’s famous fresco, “School of Athens to turn the pavilion into a light wood stepped landscape. The result is an open, informal, and common space that invites visitors to interact with fifty-six 3D-printed models of educational spaces from around the world and from different architectural periods. A really sleek and simple set-up that is a perfect response to the overarching theme established by Yvonne Farrell and Shelley McNamara - FREESPACE - treating the common academic spaces as architectural prototypes proposed for comparison. Visitors move around freely here, they can freely create their own pathway as they see fit, they are free to sit on the steps and study the architecture models, relax or share their opinions. Because the thing we liked so much about the work of Xristina Argyros and Ryan Neiheiser is this Freespace that was created inside the pavilion, turning it into a space where it can be freely used, within the limits of its original function. A concrete example of the curators' ambition to “both look back, and to scan across the current landscape of university to extract compelling and successful spaces that are free - democratic, unprogrammed, and common”. Because being able to experience inside the Greek Pavilion a bit of the dynamic and shared atmosphere that is characteristic of those common spaces in universities as catalysts for meetings and debates that generate something new and unplanned, makes us realise how important they are even for those who may not have experienced it first-hand. The School of Athens curated by London-based firm Neiheiser Argyros succeeds in evoking a freespace with a few elegant resources and presents an in-depth architectural research carried out as part of an international student collaboration between the Architectural Association in London and the National Technical University of Athens. All this using strictly white architectural models, without resorting to the widespread and colourful rhetoric of videos, animations or graphics that are in abundance in other national participations.